You need to do hard things to be happy in life. Because the hard things ultimately build you up and change your life from the inside out. Daily stress is one of the primary causes of major mental and physical health problems in our lives: it can cause heart disease, anxiety, sleep deprivation, auto-immune disorders, weight problems, unhappiness, and even deep depression. But we’re busy – we all have places to be, things to do and people to see. So, how do we alleviate stress and still get our work done right, without neglecting our loved ones and ourselves? What can we realistically start doing today to nurture our mental health and overall wellness? I’m going to be brief about this, because time is of the essence. There are eight simple (but not easy) things that need to be practiced. A few mindset shifts and a couple actions that take only a few minutes a day. These can’t solve the most severe stress-related problems, but they can help most of us in a major way. 1. Be in the moment, completely, with just one task at a time. Instead of being in a stressful task-switching state of mind, take your next task, let everything else go, and just be in the moment with this one task. Let yourself be immersed in this task by letting go of the feeling that you need to quickly rush through it – that you need to move on to the next task waiting for you. There will always be a next task, because that’s the nature of TO-DO lists – they’re never-ending. So let those later tasks come later. Just be 100% in this one task, like it’s your entire world. 2. Let go of controlling what can’t be controlled. Fear is causing you to be stressed, not external factors like your job obligations or family issues. Those external factors are just a part of life, but they become stressful when you fear failure, fear people won’t like you, fear you’re not good enough, fear abandonment, and so forth. 3. Accept people just the way they are, and smile. Instead of trying to change others, give them your support today and lead by example. 4. Perform short mindfulness practices. You can do a quick body scan (focus on your body and notice how each part of it feels right now) in 30 seconds. You can pay attention to your breath for 60 seconds (listen to it and feel it). You can watch your thoughts about concerns, fears, judgments, doubts, and ideals for a minute (recognize that these thoughts are simply thoughts; you don’t need to believe them or react to them). You can walk mindfully, paying attention to your feet, your body, your breath and your surroundings, as you walk. You can do each of these short mindfulness practices in little bits whenever you need them throughout your day. Is it true? – This question can change your life. Be still and ask yourself if the thought you’re dealing with is true. Can I be absolutely, 100% certain that it’s true? – This is another opportunity to open your mind and to go deeper into the unknown, to find the answers that live beneath what you think you know. How do I feel when I think this thought? – With this question, you begin to notice internal cause and effect. You can see that when you believe the thought, there is a disturbance that can range from mild discomfort to outright panic and fear. What do you feel? How do you treat the situation (or person) you’re thinking about, how do you treat yourself, when you believe that thought? Be specific. Who would I be, and what would I do differently, if I were not thinking this thought? – Imagine yourself in your situation (or in the presence of that person), without believing the thought. How would your life be different if you didn’t have the ability to even think this stressful thought? How would you feel? Which do you prefer – life with or without the thought? Which feels more peaceful? 6. Consciously squash the needless comparisons. Sometimes the reason we struggle with stress and insecurity is because we compare our behind-the-scenes circumstances with everyone else’s public highlight reel. Give it up. Don’t compare your Chapter 1 to someone else’s Chapter 15. Follow your own path, write your own life story, and never give up on yourself. Happiness formula = Do YOUR very best and feel good about it. Unhappiness formula = Compare yourself to everyone else. 7. Track what’s going well and give thanks. Overlooking everything that’s wonderful is a tragedy. Do your best and surrender the rest. When you stay stuck in worried thoughts of the life you think you should have, you end up missing the beauty of what you do have. You will have a hard time ever being happy if you aren’t thankful for the good things in your life right now. In a study of this gratitude exercise’s effectiveness by Martin Seligman, participants were asked to follow those exact instructions for just one week. After one week the participants were measurably 2% happier than before, but in follow-up tests their happiness kept on increasing, from 5% at one month, to 9% at six months. Even more interestingly, the participants were only required to keep this gratitude journal for one week, but the majority of them continued journaling on their own because they enjoyed it. I’ve said it before and I’ll say it again, your body is the greatest instrument you own. So when all else fails, and your stress levels are mounting, use your body to sooth your mind. The mind reflects your body by responding to its levels of tension, rate of breath, speed of movement and mental focus. Likewise your body mirrors your thoughts, feelings, mood, and responds to your state of mind, the questions you ask and the words you speak. So if the mind and body are intrinsically connected – meaning that one has a direct affect on the other – it becomes clear that if we directly and consciously take control of one, it will influence and transform the other. By mindfully adjusting how you use your body you can directly influence your state of mind, and dramatically transform your attitude. Just imagine you’re sitting there in a bad mood, shoulders hanging forward, shallow breathing and frowning. Go ahead and do this right now to experience how it influences your state of mind. And then do the opposite: stand up straight and put a big smile on your face. Take some deep, strong breaths and stretch your arms into the air. Notice how you feel better? Bottom line: Take the vehicle your creator has given you and use it! Your body is the best tool for changing your attitude and relieving stress in an instant. Eliminate unnecessary tasks on your TO-DO list. Reduce your commitments by saying “no” when you know you should. Start a regular 10-minute meditation practice. Find additional mindfulness practices to try. Spend quality time with loved ones, daily. Start doing the hard things you know you need to for yourself! Before you go, I’d love to hear from YOU in the comments section below. Which point above do you resonate with most? What helps you nurture your mental health and overall wellness when life gets stressful? “Good things don’t come easy.” – remembering this helps me persevere. I was past thirty when I finally realized that anything worth doing is worth working hard and consistently for. Now, I’m trying to help my 16-year-old figure it out, but I don’t know exactly how. She quits if she isn’t perfect the first time. I hope it’s related to her age, but I don’t know for sure. Still working on it. Either way, I appreciate your blog, email newsletters and especially your book. All are moving me and my daughter (indirectly and gradually) in a positive direction. M&A, I always enjoy your articles and emails, but this post has been especially helpful. It truly reinforces the course coaching session I just completed with you both. As you know, lately there has been a lot of drama/negativity/ uncertainty in my life, and it’s hard to see the light at the end of the tunnel, when it constantly feels like I’m just waiting for the other shoe to drop. Good point on being in the present, and thanks for reminding me that even in my mid 40’s, it’s okay to start over with a new job and embrace change – thinking that it’s not is simply NOT true. Thank you! I found this blog when I was a sophomore in high school. Now, I’ve just graduated college. Over the years, I’ve found myself reaching out for your words to find a simple sense of peace and support in the midst of my worst moments of anxiety, stress, and doubt. Thanks for being there and finding a way to put words to feelings I once had been unable to define. Hi there thank you so much for reaching out to people in need by helping them balance their life These blogs for many of us are life savers. Thanks a lot God bless both of you. Thanks for the email this morning. I was just watching the digital recording your conference from last year and I feel like this post fits in so well with my notes. Oftentimes I fall victim to your point about comparing my journey to those of others. It’s ironic how even though most of us understand that the world has a vast combination of people, we refuse to realize the combination of paths we could face. I’m finally realizing that it really helps to believe that you are a special breed. There’s a specific purpose for your co-existence with others. And since success will vary depending on who you talk to, you can’t really assume that someone else is “doing better” than you. this is a really helpful post – I often fall “victim” to every one of these – save for practising mindfulness – it is becoming more and more apparent that I have much work to do – and perhaps part of it has to do with self-forgiveness too. Just what I needed today–a reminder to this 65-year-old in a highly stressful job with grandchildren to care for that I can take one thing at a time, be in the moment, and let go. Now I want to help my grandchildren learn to purge untrue thoughts–I see every minute of the day how their untrue thoughts about themselves and others are creating a stressful (un)reality for them. I hope I can figure out how to help them recognize this. All of your posts/articles are truly inspiring but this was exceptionally amazing, helpful and thought provoking. I am feeling truly inspired and I will be taking baby steps to recreate myself by following your guidance. Many thanks. TY for your encouraging wisdom. Hey! So… like 6 months ago I was under, study stress and believe me; not the easy one. I had to study a lot I was told to give my exams and just two days after that I was to give my main IGCSE’s (Mathematics, Biology, Physics, Chemistry and ICT). It was hectic but I just kept on telling my self “Focus on the main goal, not the small bits and pieces of it” and I also lived the moment in a very happy way. Now I can’t remember being stressed, even in my worst situations. Exercise, exercise, excercise. Even a 10 minute walk works wonders and gives you time to draw in your focus on the moment. During stressful times, I always benefit from exercising, having good conversations and reading something positive. Your emails are life Changing and life saving. Thank you so much! I have survived the worst year of my life and believe me when I say Marc and Angel played a huge part in getting me through it all. Their wisdom, gentle words, and a exceptionally well written book were my source of inspiration to continue living. Even when I didn’t want to. Every morning i wake up i rush here because i know I won’t be disappointed and I’ll have a good day! Release some endorphins, get your heart rate up and get out of your head. Get a workout in after you get up in the morning and make laughter the last thing you do before bed. You’ll be a lot more prepared to deal with negative thoughts and self-talk that way! Tackling with day day stress is challenging if you do not understand what causes you the stress. We can first understand what is good and bad for us and then accordingly adjust in it. Sometimes faith in god also helps in dodging all the stress related problems. I love this post – it is packed full of really useful ideas for decreasing stress levels. I am a terrible procrastinator and am determined to use the tips in item 7 and “Closing Thoughts” to get this under control. Best point resonate with me is #2. Yes, my fears. In fact, I live in fantasy word where everything and everyone respond the way I want. This very habit of mine making me away from my present. 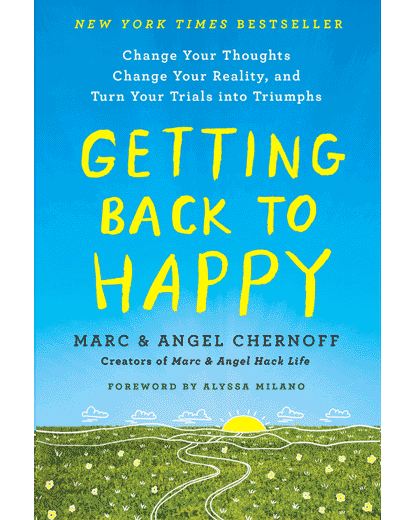 Joined Mac and Angel yesterday, hope, their insight and wisdom help me to live better and purposeful life. Thanks Marc! Couldn’t agree more with what you said. I have been feeling in slump this past year as I am dealing with difficulty swallowing and IBS. I am so down. I didn’t how my health could affect mind this much. I will follow your tips to feel better mentally. Thank you so very much for letting me know that I am special, I have all power to create my own happiness ! I started reading your blog three years ago! Ever since I never miss any article! I am from maldives. Even though we are in different county, I feel so connected to M&A ! I very much appreciate your work. Thank you !